A warning croak in my left ear signals an interloper — a Great Blue Heron who then flaps into view. He drops on a perch, perfectly framed by the same mesh of branches which engulf the warbler. The light yesterday was so anomalous that I’m sure I said these words at least 27 times: “Look at that light. I can’t believe that light.” My comment reflects first, how lovely northern, winter light really is, with the sun’s rays beaming at low angles through atmospheric particles, gifting us with magic hours. Second, my comment suggests an ebullience deriving from life in the Northwest, where gray and drizzle drive us into blue tones, mist, and sequestration — and where we all rise from our burrows and dust off like moles when the mystery orb in the sky reappears. 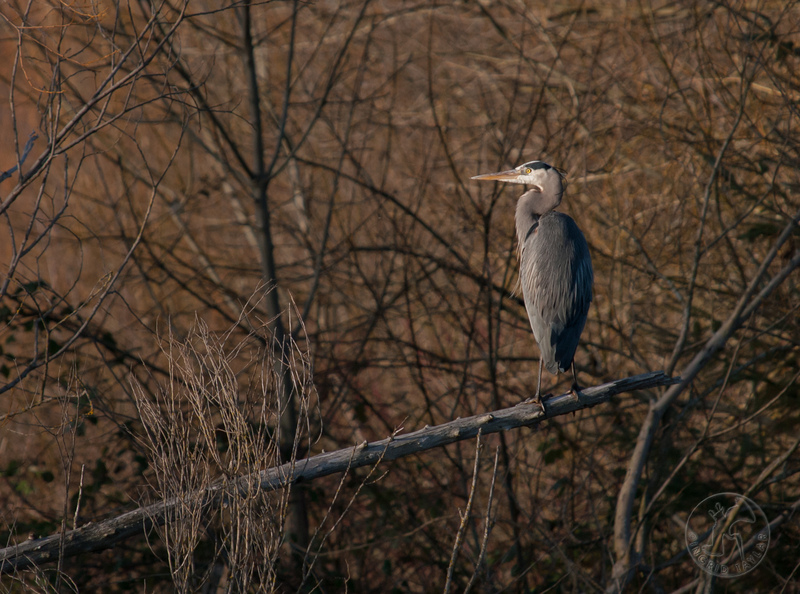 Thanks to Larry at the local blog Union Bay Watch, I learned something today about the Great Blue Heron that I didn’t know but should have known: In 2003, the Great Blue Heron was chosen as the City Bird of Seattle. Here’s the process and reasoning through which Resolution 30586 was adopted, unanimously. The American Crow came in second and the Northern Flicker, third, with several other honorable mentions (e.g. the Osprey). A RESOLUTION designating the Great Blue Heron as the official bird of the City of Seattle. The Great Blue Heron is hereby designated as the official bird of the City of Seattle. That Yellow-rumped Warbler is lovely. I’ve yet to improve my warbler experience; the only one I’ve shot is the Bananaquit. Hehe! Both birds are beautiful enough to gaze at all day long. I love how the shades of each blend in with their respective surroundings. They’re quite the color-coordinated fashion statements, standing on their respective “runways” like top-flight models in all their finery! But more than their lovely outer appearance, I feel their inner calm, and that is what brings me peace. As I’m sure it does their splendid biographer/photographer. Thank you for those kind notes, CQ. The warbler actually did bring me that kind of serenity. I saw her bobbing around the tree branches and wondered if my presence would bother her, if I lifted my lens would she flee? But she went about her business as I looked on. Even though I got just this one precious shot of her little frame, free of branches, I felt at peace just being in her presence as she engaged her world in her own warbling way. CQ’s observation was exactly what I had in mind to say… Although not quite as poetically. Comparing Ms. Warbler to a runway model really does the trick. Who can’t recall when the shoes had to match the gloves had to match the hat? In bird-fashion it seems the feathers must match the twig, must match the bark, must match the fungi. And the heron it seems must match whatever breathtaking spot he’s in! NOW, THEREFORE, BE IT RESOLVED that birds are remarkable beings and that Ingrid is one of their most dependable advocates. I think your poetic touch “matches” CQ’s — and I grinningly (word?) agree with your official resolution, Bea! 🙂 I bet Ingrid’s blushing. What an incredible blog you have, Ingrid! 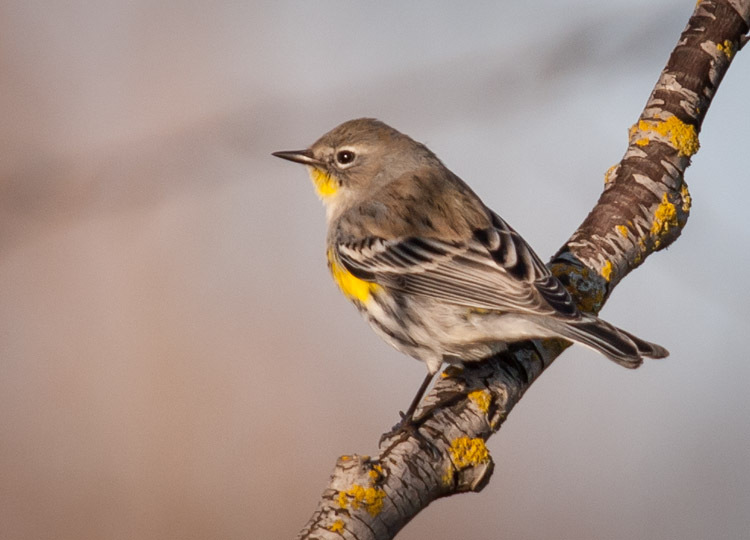 Your Yellow-rumped Warbler photo is gorgeous! The colors of the branch coordinate so well with the colors of the warbler!